WORLD WAR TWO | The International Cricket Hall of Fame. 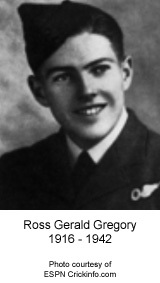 Ross Gregory was born on 28th February 1916 in Murchison, Victoria. A schoolboy prodigy, Gregory made his First Class debut for Victoria whilst still at school at Wesley College. He then made his Test debut a few weeks shy of his 21st birthday. On 29th January 1937 Gregory took to Adelaide Oval to play his first Test, the fourth of the 1936-7 Ashes series. He made 23 in the first innings and 50 in the second to help Australia to victory in the match that lasted six days. Gregory was then selected for the final Test of the series where he made 80 in Australia’s only innings. Australia won the match and the series 3-2. Gregory was unlucky to not be picked for the 1938 Australian tour to England however it was said that being so young his time would come. As fate would have it Gregory never played another Test. When war broke out Gregory enlisted in the RAAF as a Pilot Officer. On 10th December 1942 Gregory was killed when the Boston Bomber he was navigating was caught in a storm during an operation over East Bengal (now Bangladesh). Everyone on board died. Gregory was just 26 years of age. Fourteen days later the news of his death reached Australia. St. Kilda Cricket Club’s Ross Gregory Oval is named in his honour.